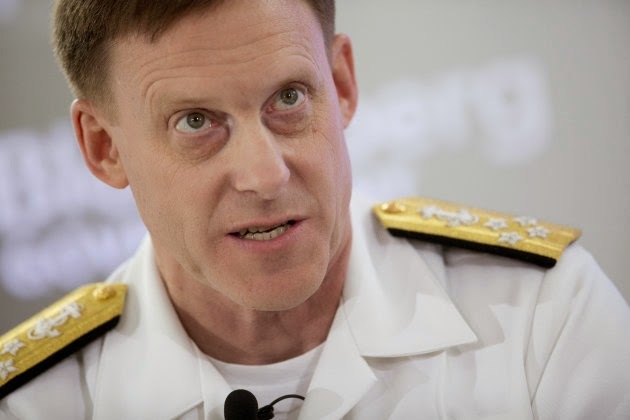 Freshly minted Director of the National Security Agency Admiral Mike Rogers, told a conference held by Bloomberg that the accusations the NSA was using facial recognition widely along with access to driver license photos because such activity is not legal and "We do not do this on some unilateral basis against U.S. citizens." Acknowledging the activity would illegal is huge, especially taken with the track record of his predecessor General Alexander and his boss Director of National Intelligence James Clapper. That the facial recognition could be used with photos from each state's , commonwealth's and the District of Columbia's department of motor vehicles, is a collusion of the security state and the civil bureaucracy that beyond the pale. What is very likely a work around is that outside vendors such as Booz, Allen Hamilton currently headed Michael Hayden (former Director of National Intelligence) utilize commercial databases that access the states' photos and through such an intermediary Adml. Mike Rogers' statement becomes accurate and lawful while continues to be deceptive to the exactly the people that pays his salary and are the only threat that could possible be neutralized with mass surveillance: the American public with legitimate criticisms. If legal questions arose regarding how the surveillance operated, and they were obtusely in the unlawful and unconstitutional side of things, then it would behove everyone that took part in that criminality to obfuscate exactly what was done regardless of the effectiveness of the illegal actions taken. The Senate Intelligence Committee has oversight over the Central Intelligence Agency, who ran the "enhanced interrogation" that according to the former interrogators were unfruitful in providing any intelligence, so in the Intelligence Committee's oversight duty they are responsible for bringing accountability the CIA. If the CIA, or assets working on their behest, may have committed crimes with regards to torturing prisoners then they have all the incentive in the world to obfuscate and obstruct anyone from discovering and then prosecuting those crimes; Back in February, the staffers of the Intelligence Committee were doing just that while the CIA allegedly was destroying evidence when the staffers removed documents that were classified but threatened to be destroyed. The NSA has the same motivation to obfuscate and block accountability regarding surveillance that is directly an affront to the 4th Amendment- but more so in that the claims that these practices were effective when they were not effective in ferreting out and thereby preventing mass casualty events and explosives such as the Boston Marathon Bombings in 2013 and the Times Square Armed Forces Recruitment Center Bombing in 2008 (intentionally set when no casualties would occur). Was mass surveillance effective to prevent crimes, or even discover foreign intelligence then Edward Snowden would have been discovered when he initially reached out in December 2012 or the use of chemical weapons by the Syrian Army would not have been in doubt with unambiguous intelligence. Like the quote from the title of this post, the surveillance state needs to win this war or be tried for their crimes, the only difference is their enemy they are fighting a war against is the American public.